Twin boys Isaac and Calvin with their two year lold brother, Gio. The twins are wrapped in gray and are on a gray flokati rug. 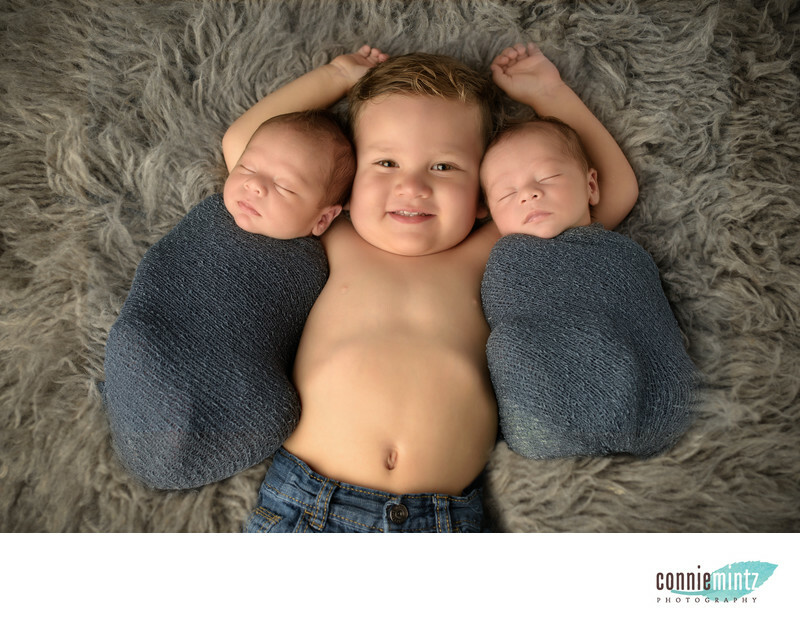 This is a sibling shot that is included with a newborn session. I'm trying to capture a relationshop between the brothers. Gio is full of emotion as we capture his newborn baby brothers. Family lives in Portland Oregon. I'm so excited to have twins in my studio in Vancouver Wa. Be sure to schedule your newborn session at least 3 months before your due date. This image was captured with a Nikon D810 with a 24-70 lens using studio lights. Mom really wanted a picture of her boys together and I'm so happy I got this!Keywords: baby (45), gray (36), newborn (123), Newborns (24), Photographer (12), Photography (9), portland (6), portraits (6), Siblings (15), twins (15), Vancouver (12), wraps. photographs (6). 1/160; f/4.0; ISO 64; 35.0 mm.